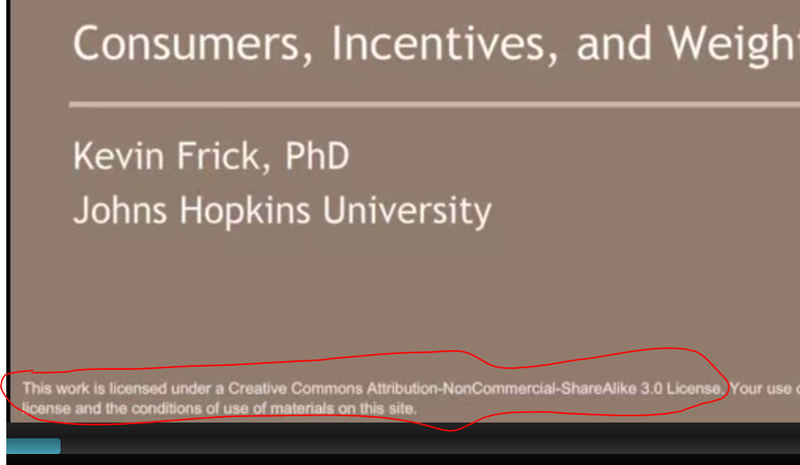 Obviously what has happened here is that Johns Hopkins and Kevin Frick have negotiated additional rights for Coursera to this OCW material, which allows them to use it commercially. Which is as it should be — that’s how CC licences are supposed to work. A CC-NC license is not a blood oath; the license holder can negotiate exceptions. In fact, that’s the point — if you’re going to use this commercially, we want a cut. Or veto power on use. Or whatever. Still, it’s interesting seeing it in there. As far as I can tell, there’s not much in this course so far that wasn’t in the original OCW material. I’m a week and a half in, and basically there are the audio lectures that they added on top of the slides. That’s pretty much it. The much-vaunted in-video quizzes are actually few and far between, and don’t show any particular genius in formulation. A segment that involved Kevin talking to the camera, which appears to be additional, was poorly executed and thought out — I ended up having to cover the video of him in order to follow along in the slides. The explanation of supply and demand doesn’t involve a single quiz, simulation, manipulation, or application. It’s just listening to audio while flipping through charts. This isn’t to say it’s bad — the topic is interesting, and Kevin has a knack for staying out of the weeds in his presentation — it’s difficult to teach a one-off course interdisciplinary course like this, at the right level of complexity, and he nails it. But what value was there was there before Coursera arrived, and was available for free. Again, what does Coursera add here? Rocket science? Amazing educational insights? Stanford-level brilliance about about how to tap networked learning? Nope: time-released OCW (I cant see next week’s materials yet), a set of cohort/peer tools, and an audio track for the slides. Given all we know about online education, it’s pretty odd that this is the game changer that threatens traditional education. But for various social, economic, and political reasons, it is. How very, very, weird.